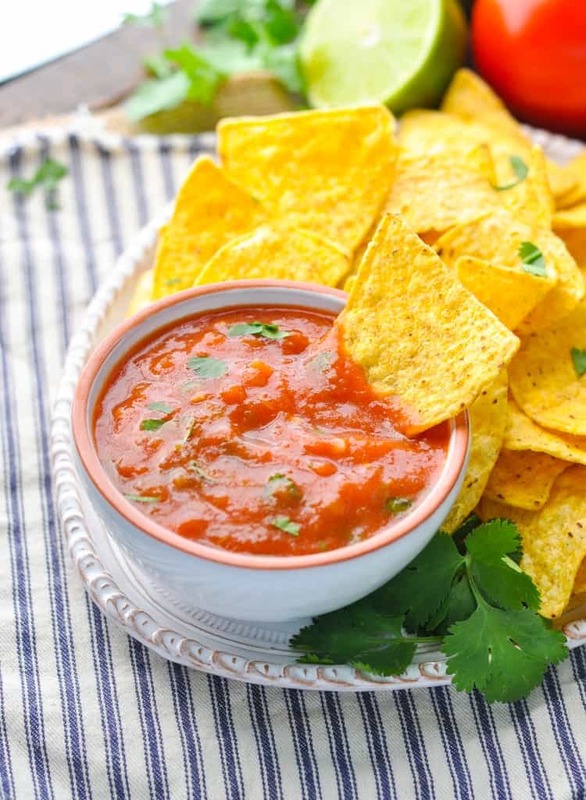 Chips and dip are an instant party hit, and there's just no more popular combination than the classic: tortilla chips with salsa! This Fresh 5-Minute Homemade Salsa takes advantage of seasonal ingredients and adds a little kick to your next get-together or weeknight dinner! 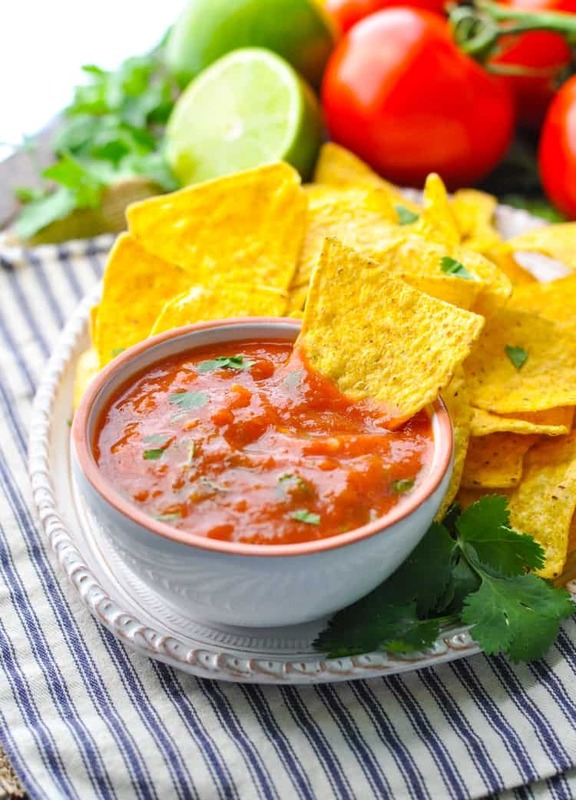 Chips and dip are an instant party hit, and there’s just not a more popular combination than the classic: tortilla chips with salsa! This Fresh 5-Minute Homemade Salsa takes advantage of seasonal ingredients and adds a little kick to your next get-together or weeknight dinner! 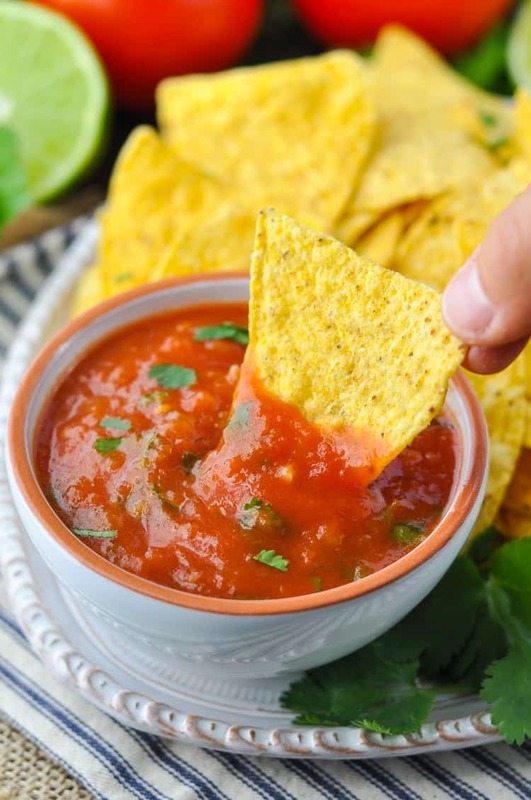 Is it just us, or does your family also choose a favorite restaurant based on the quality of the chips and salsa served? I know that we can’t be the only ones focused on this important criteria! 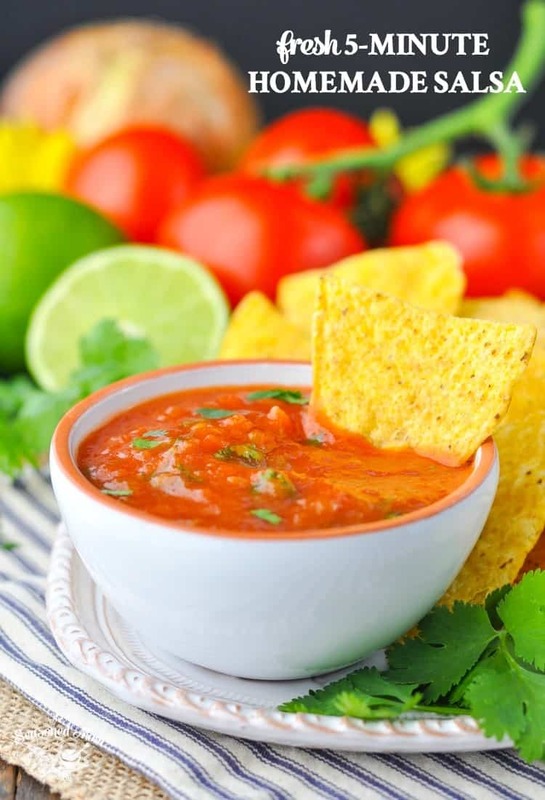 When you’re making your own homemade salsa, you need a high quality chip that perfectly complements the fresh, bold flavors. 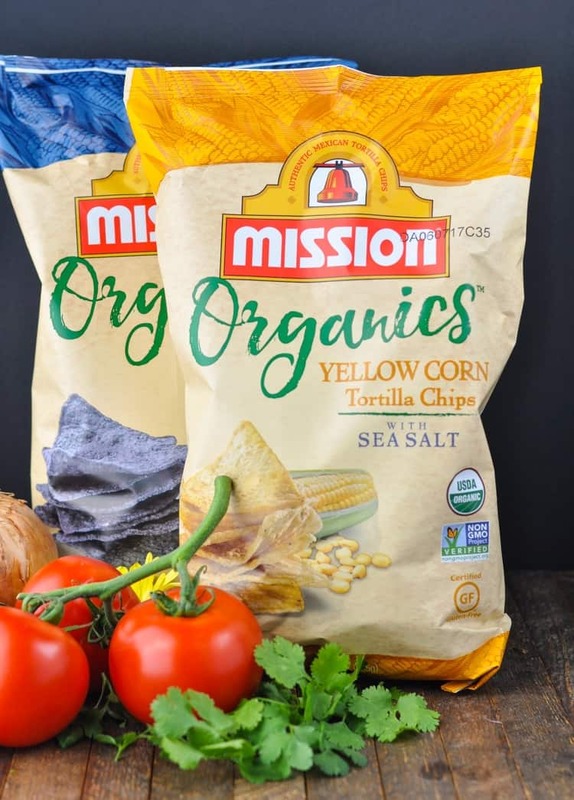 Mission Organics® Tortilla Chips are the chips that your dip deserves! When we were invited to a picnic with friends last weekend, I was tasked with bringing a side dish. 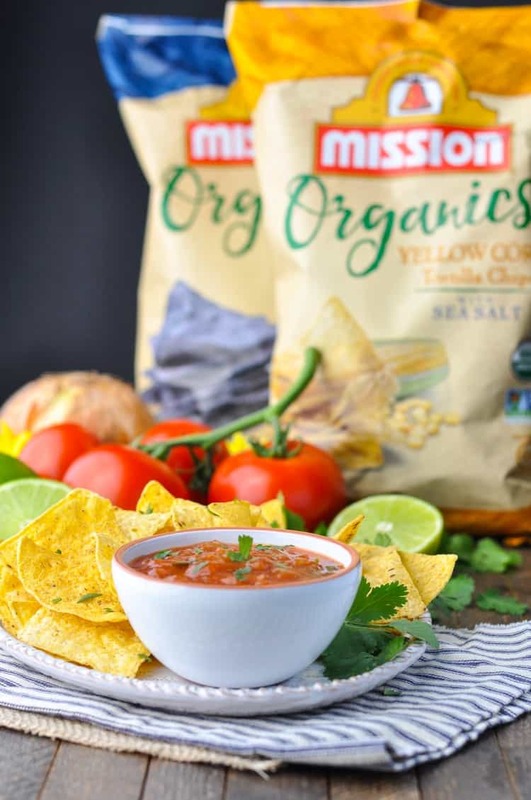 On my weekly shopping trip to Kroger, I grabbed the ingredients for this homemade salsa, as well as a couple of bags of the Mission Organics Tortilla Chips. Only the finest for my friends and family! These tortilla chips are USDA organic certified, non-GMO project verified, and they come in a variety of flavors. I picked up our personal favorites: the new Yellow Corn tortilla chips and the Blue Corn tortilla chips. You can also find new Multigrain tortilla chips at your local stores! The chips are sturdy, crunchy, and perfectly seasoned to stand up to a great dip! 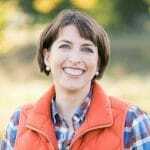 As I mentioned above, I picked up the Missions Organics Tortilla Chips and all of the ingredients for my homemade salsa at my local Kroger in Charlottesville. You can use the store locator to find the chips in your area, and be sure to check out the additional recipe ideas as well. They’ve got Tequila Guacamole and Cheese Nachos as well as Chimichurri Steak Tacos! Oh my YUM. Let me know if you give the salsa a try this summer, and enjoy! 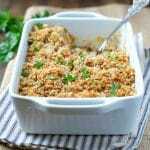 Place all ingredients in a food processor or blender, with the tomatoes, chilies, and onion on the bottom (closest to the blade). Pulse a couple of times to chop up the larger chunks, and then puree until salsa reaches desired texture. Taste the salsa and season with additional salt or honey, as desired. 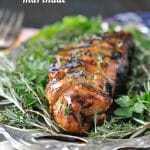 Serve immediately, or cover and refrigerate for several hours to allow flavors to blend. Cooking for a Smaller Crowd? 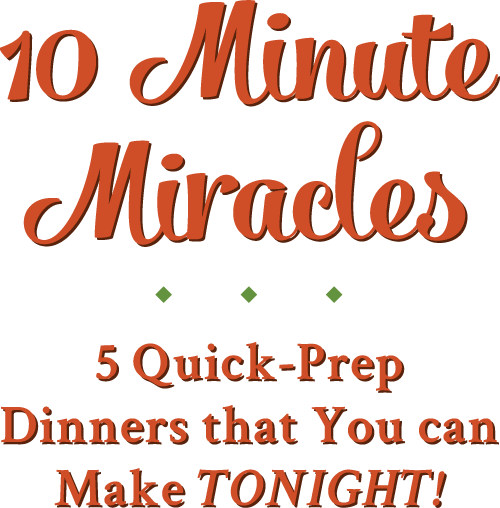 You can easily cut the ingredients in half to prepare a smaller batch. The instructions remain the same! Previous Post: « Classic Southern Macaroni Salad + a Video! Yep, my husband and I know the best and worst Mexican restaurants to go to for the chips and salsa. After all, chips and salsa make the meal! I always over-indulge on them at Mexican restaurants, but it’s the best part. I love your homemade salsa, Blair! I could see myself devouring this ALL in no time. Looks so good! This looks awesome! Love the simplicity and freshness, and that is can be made in a bind. Definitely saving this one! Fixed your egg and ham casserole tonight. It was a smash hit! 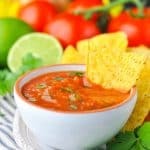 I have been looking for a fresh salsa recipe and this sounds great! I just was wondering, do you have to use honey and why do you use honey? I’m a diabetic so I was just wondering. Hi, Margaret! 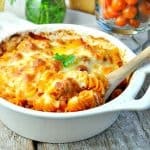 So glad that you enjoyed the egg casserole! 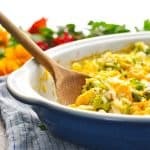 Is this recipe ok to freeze? Hi, Emily! I honestly don’t know. I’ve never tried freezing the salsa, so I’m not sure how it would turn out when thawed.